Then there are the technical steps and new beloved ingredients of today’s pioneering chef tier that the father of haute cuisine would slowly welcome into his repertoire. I’m sure he would eventually grow to accept sous-vide cooking and would not abuse the vacuum sealing process, as is too often seen today. And finally, you come upon the little jolts that show just how rewarding dining is today because chefs know how to be daring, while also being thoughtful. Try to think of a more daunting industry to succeed in. Colleges divide themselves into departments of arts and sciences. Forget about separating the two if you’re a chef. Running a restaurant and cooking on a nightly basis is an art and science together. That brings us to the sometimes subtle, sometimes you wish it was subtle, high-wire acts that chefs and restaurateurs are presenting these days. There are card games involved with dessert. There are dishes that are strictly meant to be smelled. No part of any living species, animal, plant, or neither, is not explored and foraged as a potential component for tonight’s menu. And, speaking of the menu, a menu usually is one of the more straightforward, less roller coaster rides of a meal, outside of the price listings. It tells you what is being offered from the kitchen, unless of course the kitchen does not want you to know the upcoming omakase flurry. There might be a logo on the menu. The dishes might be written in a particularly elegant font. This sure is one lovely bug. It’s just so cute. 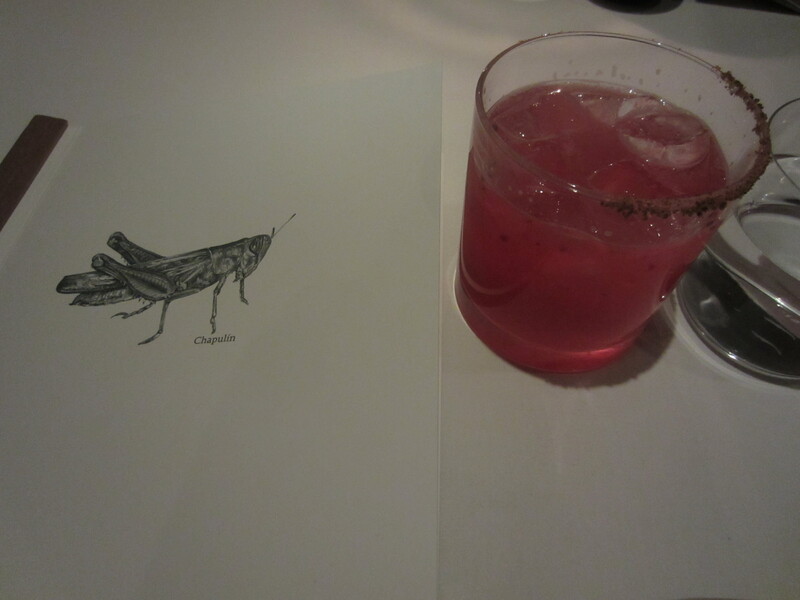 It’s a beetle on the cover of the menu at one of the most important restaurants in the world. Now if that doesn’t get most diners hungry, I don’t know what does. With Pujol now the 36th (not 35th!) best restaurant in the world, according to the very scientific yearly San Pellegrino- Restaurant Magazine rankings, the cosmopolitan, ravenous crowd each afternoon (in Mexico City, remember lunch starts late and is the main meal of the day) and evening doesn’t need a bug to increase or decrease their hunger levels. This is the domain of 37-year-old Enrique Olvera, arguably the world’s biggest rock star-caliber chef that most of the world has never heard of. It wasn’t always this way for Olvera. Born in Mexico City, the chef-student graduated from the U.S.’ premier cooking school, the Culinary Institute of America in Hyde Park, NY, and then worked under the venerable French haute cuisine master Jean Joho at Everest in Chicago, before returning to his home town and opening Pujol. 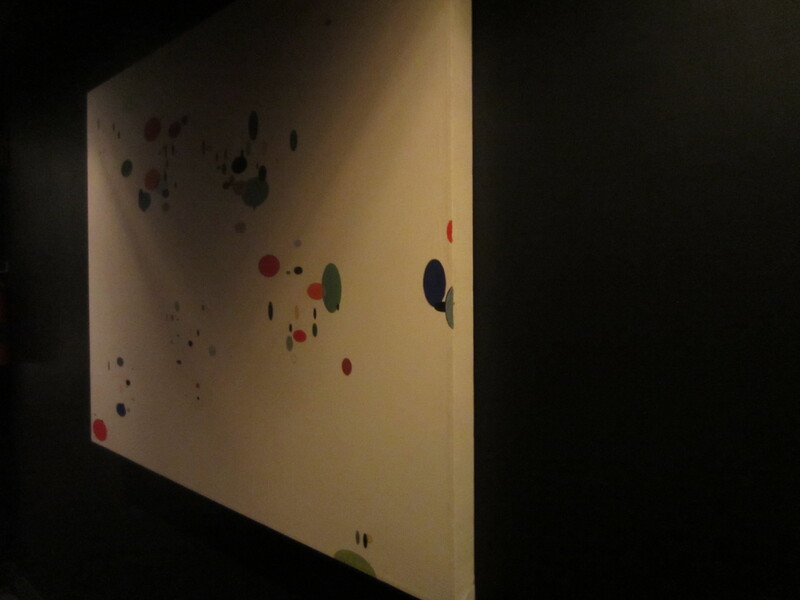 Earlier this year, Olvera told The Wall Street Journal’s Hamish Anderson that his goal opening Pujol 13 years ago was to be “the best restaurant in the neighborhood.” Anderson continues to point out that the budget was so small that Olvera’s wife even had to paint the walls. Let’s just say the suave, GQ, jet-black colored dining room seems to have been renovated recently on a slightly higher budget. Like so many of the world’s most cutting-edge, genre-defying chefs, the present state of their menu continues to evolve from much simpler beginnings, and who in the world knows what might be next. 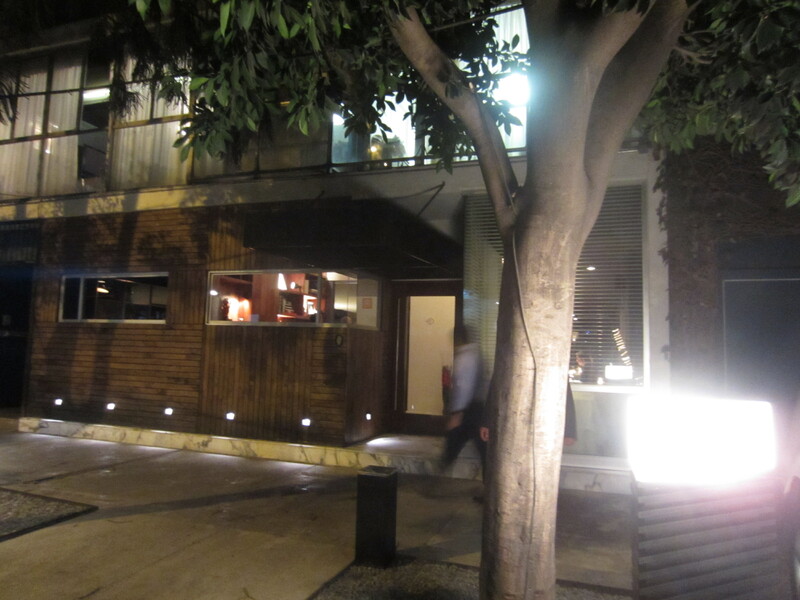 A meal at Pujol, in early 2013, offers both a 10-course dégustación at 990 Pesos ($78 USD) and a four-course menú clocking in at 890 Pesos ($70 USD). Do the currency exchange math and, my goodness, is this a good deal. Yes, this is not a “cheap eat,” but for the creativity and execution of this restaurant, the price could easily be over $200 USD per diner. It probably will get closer to that before too long. 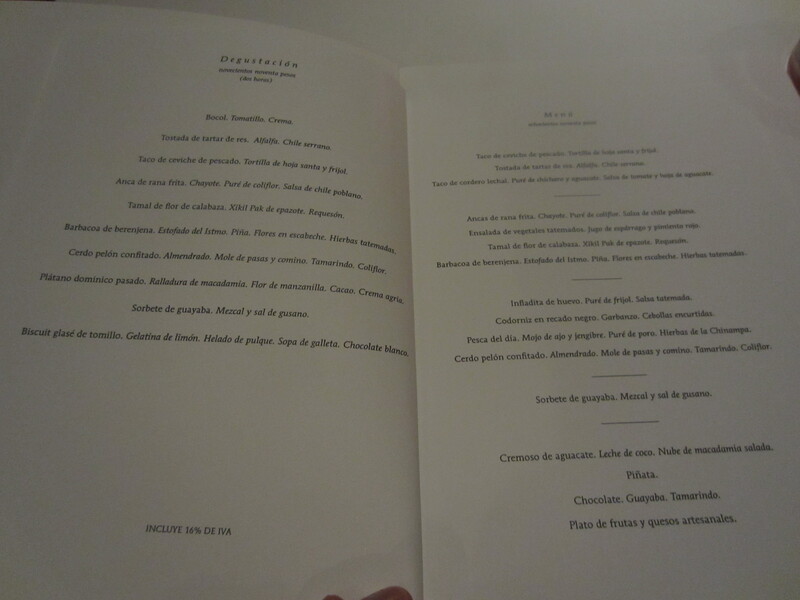 Then again, it’s truly the food that puts Pujol amongst the world’s elite. The complete experience isn’t the fully refined, fine-tuned, fine dining operation that many of its peers at this top tier are. The restaurant itself still operates like a special occasion bistro, more for anniversary dinners, birthdays, and major business meetings than for once in a lifetime, bucket list experience. Walk into the dining room, feel the bustle, and you could be in dozens of restaurants in San Francisco, London, or Manhattan. Even the tasting menu states that it will take two hours. Dining of this caliber should not be on a clock. If I had one personal request, it would be to steer clear of the power-dining concept with such a precious gastronomic experience to be had in Olvera’s hands. Service varies from the consummate professional, who clearly has been doing this for years and nothing nor anybody will phase them, to young servers such as the one who initially took my orders, who seemed more trained in the New York new-school style of indifference and turning tables as the modus operandi. He clearly grew frustrated over my delay while browsing through the various drink lists unable to find the cocktail I had been tipped off about by a few locals. The classic cocktail list reads straight out of the Savoy playbook: perhaps a Negroni or a Gibson? A Manhattan is great with all its Maker’s Mark and Vermouth glory, but seriously, where in the world is a Margarita? This is Mexico City after all; they should have the drink every visitor wants, right? Yes, yes they make a Margarita. In Mexico City the question is not, frozen or on the rocks? You will get a Margarita on the rocks because the other is a waste of good Tequila. You will instead be asked about the type of Tequila or Mezcal, perhaps with a certain fruit juice or spice? They are very particular about their agave-based spirits here in the D.F. (Mexico City is known as Distrito Federal) you will learn after a few seconds. The Pujol House Margarita is a masterpiece. It is served in a highball glass on rocks that avoided melting over the course of a half hour, with the perfect level of sweetness and a vibrant ruby hue given to the Blanco Tequila-based creation, that comes courtesy of prickly pear puree, the fruit on a particular species of cactus. A cloying, sugary mess of a Margarita this is not. Even thought goes into the chili salt rim, surrounding only half of the glass’ rim. You don’t drink this type of a cocktail out of a straw, thank you. Then again, you may not want every sip to feature chili salt. This is a thinking man’s Margarita, a concept not often approached. The common way to begin a meal in Mexico City is with some of that wonderfully smoky, Agave-based spirit that once was relegated to Tequila’s poor cousin and now is the darling of craft cocktail bars across the U.S. – Mezcal. Pujol’s extensive list covers all the bases from a 60 peso Agave Azul to a 374 Peso Pechuga, with nearly all the selections from Oaxaca. Foolish me didn’t know to order Mezcal at the start of the meal, so with dessert, the waiter steered me towards the exceptional Arroqueño, from the Mezcaloteca in Miahuatlán, Oaxaca. One big difference with Mezcal at Pujol is the form of oranges and Del Maguey worm salt that are mandatory accompaniments with Mezcal. Usually, the oranges come as slices rubbed with the worm salt. Here, a Cabernet Sauvignon glass comes a third full of orange juice, with a rim of the worm salt. Does it work? Yes, not necessarily better, but a lot less messy. Pomp, circumstance, and opening ceremonies concluded, the work of Olvera’s 27 chef-strong kitchen gets under way with a trio of amuse-bouches. You are instructed to first sample a miniature aguachile ceviche, dominated by the commanding presence of sesame paste in the otherwise subtle ceviche, all sandwiched between wafer-thin slices of avocado. Here’s your guacamole and ceviche in one re-interpreted, two-bite session. Next is the coconut shell. Or, at least it looks like what you might drink out of while stranded on a South Pacific island. It’s actually a hollowed-out squash gourd, filled with torn-off corn husks. Nearly every diner in Pujol’s history has encountered the magic of this dish, a riff on the classic Mexican street corn, usually eaten on a stick with a little salt, lime juice, and sometimes a dash of cotija cheese. 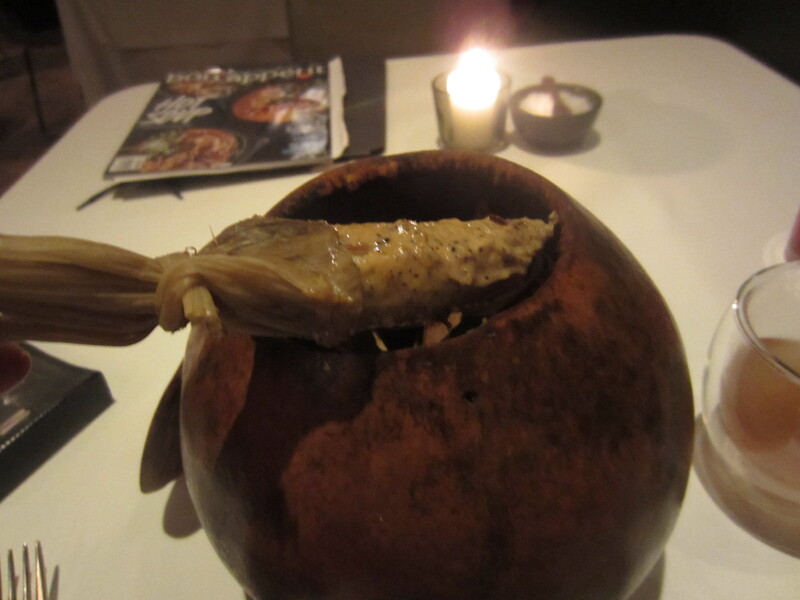 The single elotito per person inside the gourd is grilled to a consistency where the baby corn almost melts inside the gourd. There is no stick here. Rather, diners hold the corn cob’s husk and just eat the corn whole. However, it’s not just corn you’re discovering. The cob has been slathered in a coffee-fortified mayonnaise, accented by ground flying ants the size of cracked pepper dots, lime, and salt. The combination of the earthy coffee, rich mayonnaise, funky zip of the ants, and the pillowy soft corn led me into a momentary blur, where I started eating the husk once the cob was gone, before gathering back my senses. The corn is then followed by a clear-glass, espresso shot glass holding a cleansing “tea” that is a broth based on corn with plenty of ancho chile hits, the salsa dancing amigo to miso soup, that more closely brings to mind a Northern Vietnamese pho. 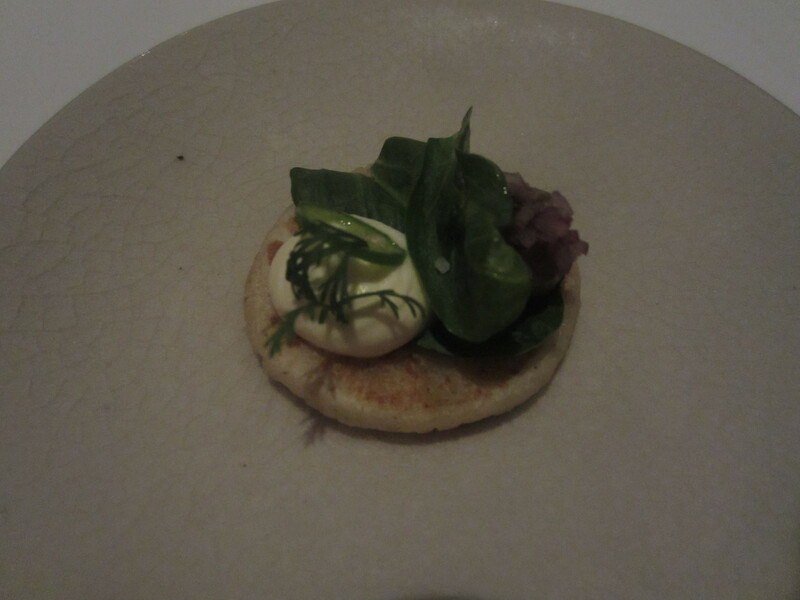 Afterwards, the ten listed courses go in succession through to the dessert, opening with a diminutive, striking bocol topped with spheres of tomatillo, diced onion and cream. The masa-based, thinly pounded bocol is essentially the size of a sope, sharing the common open-faced style, but much thinner as a base. It’s a taste shot, gearing you up for the ensuing journey. 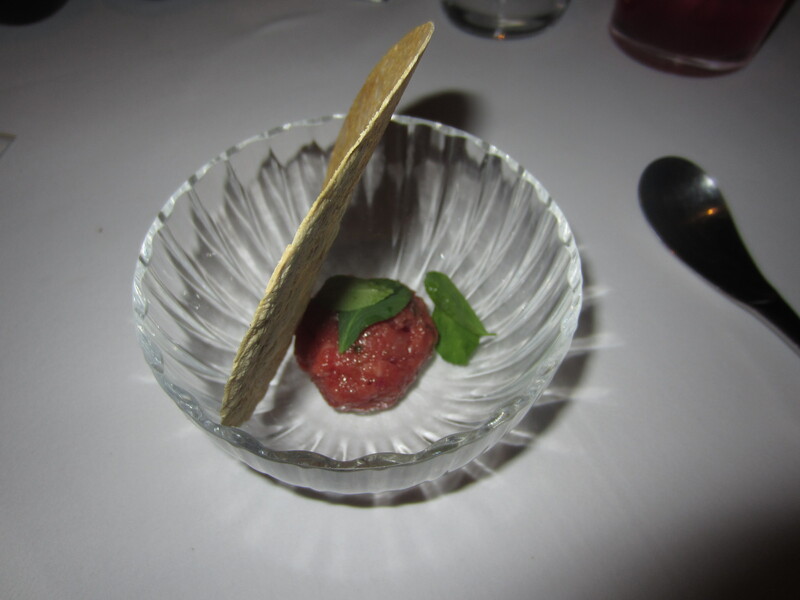 After the arrival of a salsa verde and a spicier red salsa (the butter or olive oil for the meal, except there is no bread involved), the one misfire of the evening is a ball of beef tartare with a few leaves of alfalfa. The Serrano chile infused into the meat barely is detectable, and the tostada shell tastes both bland and stale. Matters get back on track with the evening’s taco. Tortillas don’t get better than this corn version, pressed with the green leafy plant hoja santa. The actual underside of the tortilla is the leaf itself, a fascinating turn of events. Hershey Kiss-sized dollops of beans surround the central, deeply marinated fish. The real kicker to the taco is the salt blast from the fish chicharrone (crispy fish skin). 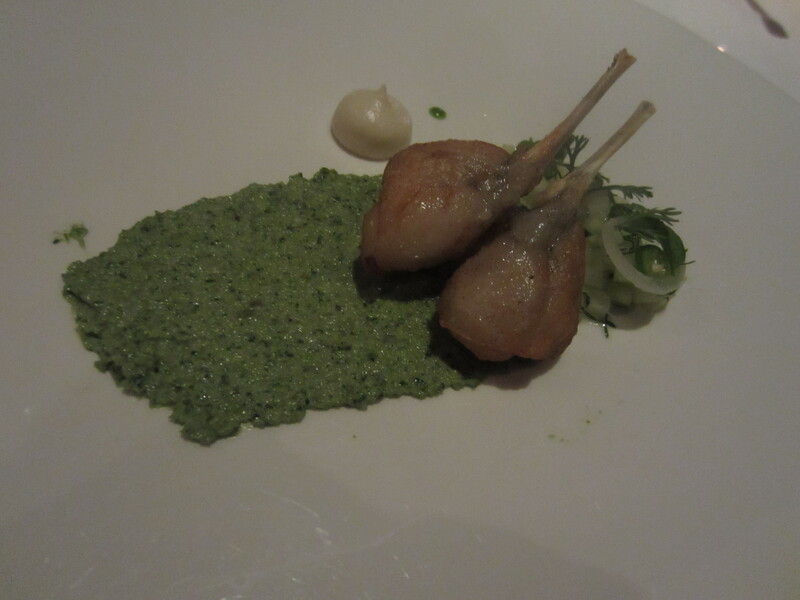 Speaking of Escoffier, frog legs follow the taco. Lightly fried, they look like petite chicken drumsticks and yes, even taste like very moist dark meat. The twin legs lie at the end of a gallant smear of poblano chili sauce, appearing and tasting the part of a Mexican pesto. Olvera seems to love his Hershey Kiss pipetting, again used here with a cauliflower puree. Beef Tartare Tostada. Alfalfa. Serrano Chili. The aquatic portion of the menu concludes there with a shift to the Earth. A delightful tamal stuffed with requesón (a dead-on resemblance to ricotta) rests atop epazote Xikil Pak sauce, a thick pumpkin seed puree that comes from the Ancient Mayan period centuries ago. 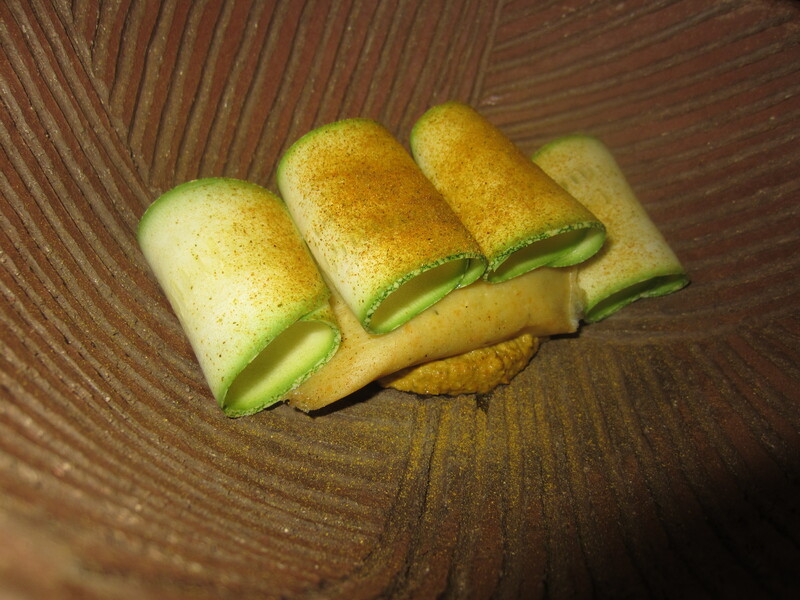 A quartet of green squash ribbons garnish the tamal, dusted with something called squash powder. It’s a magical tamal, balancing between being not too wet nor too hefty and chalky. Fish Ceviche Taco. Hoja Santa Tortilla. Beans. Near the halftime portion of the meal now, you start realizing the game plan at play by Olvera and his team. In his interviews, Olvera frequently comments on how beloved Mexican cooking is worldwide, but how it is always considered a very informal, casual cuisine. Cochinita pibil is not exactly what often comes to mind when you ask people about Mexican food. It’s tacos and burritos. Fajitas and guacamole and chips and salsas. Margaritas and Tequila shots. And even more unfairly, half of those listed items aren’t even Mexican cuisine. They’re really Tex-Mex or Taco Bell or San Francisco’s Mission District inventions. When I lived in a small town in Ohio, worlds away from Mexico, there were two “Mexican” restaurants. They of course served chimichangas and burritos filled with Spanish rice, not tacos al pastor or lamb barbacoa. Olvera is absolutely aspiring to bridge the gap between traditional Mexican cuisine staples with gastronomic techniques and flair, showing it’s very possible to stay rooted to traditional dish ideas and native ingredients, while pushing the envelope with global influences. This is not an unheard-of style. Just look at New Nordic cuisine today or what is going on in nearly every country with remarkable chefs that look to evolve the native cuisine. Yet, for some reason, nobody thinks that what Olvera is doing is possible. Fried Frog Leg. Chayote Squash. Cauliflower Purée. Poblano Chili Sauce. 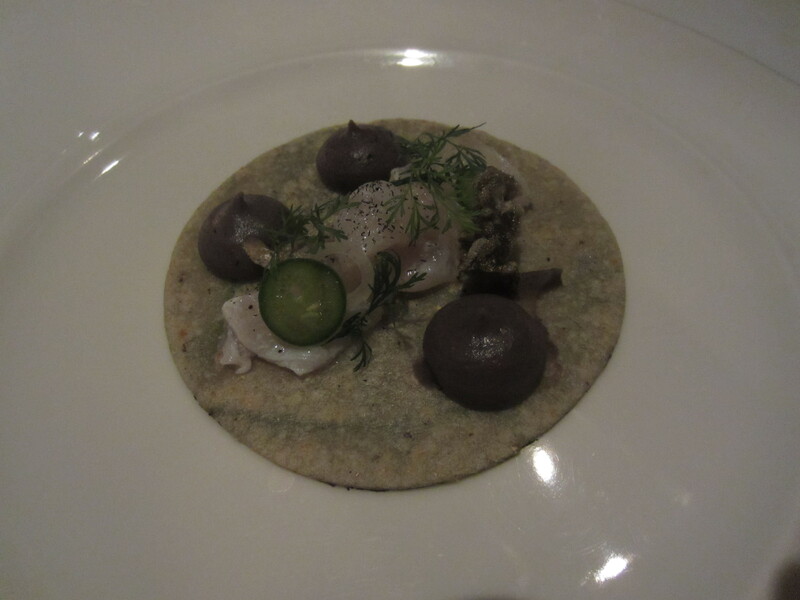 It is very possible, and chefs across Mexico are carrying on the dialogue Olvera has started. Chefs covet to work for Olvera so much that there is a year-long wait just to be an unpaid stage in his kitchen. 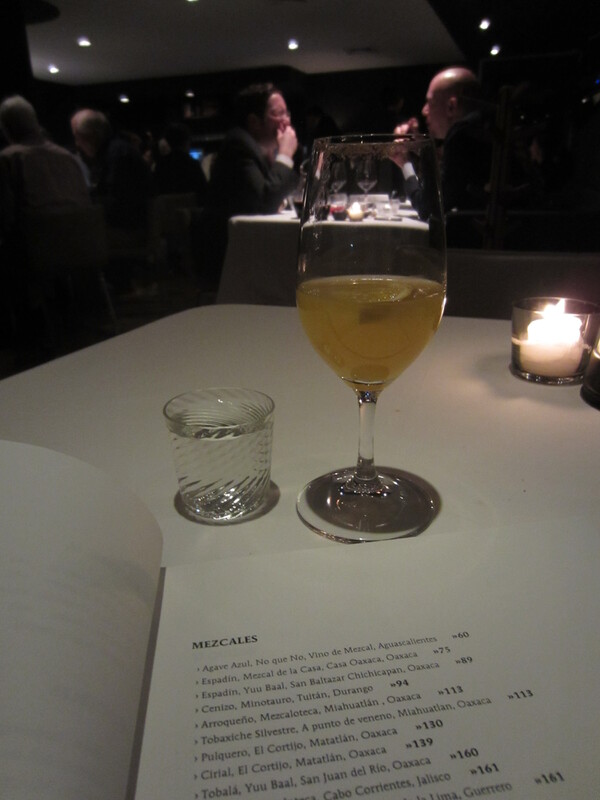 Even the wines on Pujol’s surprisingly expensive list, compared to the rest of the menus, speak heavily of Mexico. You’ll find plenty of French whites and trophy Napa reds, including a 53,000 Peso 2009 Cabernet Sauvignon from Screaming Eagle (is that a good deal?). The excitement comes from the Mexican wines, mostly coming from the Valle de Guadalupe in Baja, California. Options include the stellar Chasselas del Mogor from the Mogor Badán Winery, and the Gran Ricardo Tinto blend by Monte Xanic. Unfortunately, the Mexican wines are exceedingly expensive. The cheapest Mexican red by the glass alone goes for 378 Pesos ($30 USD). 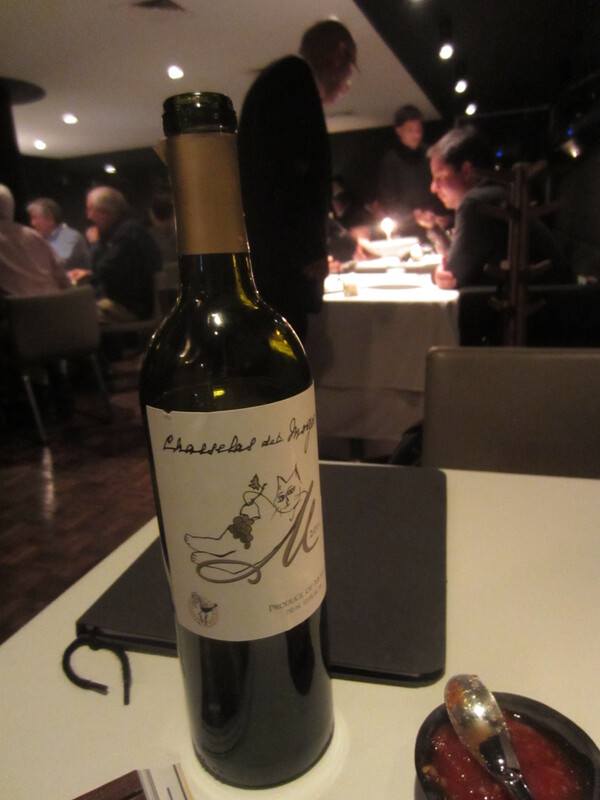 However, that Gran Ricardo Red certainly would go well with the next part of the meal. 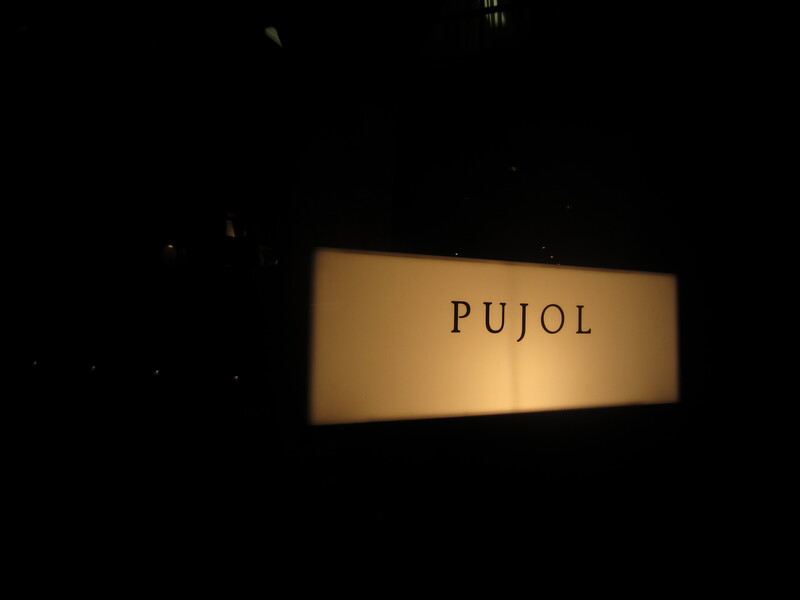 It’s starting here when you notice that there really is something special about Pujol. You start realizing why Enrique Olvera is one of the country’s most important figures today. 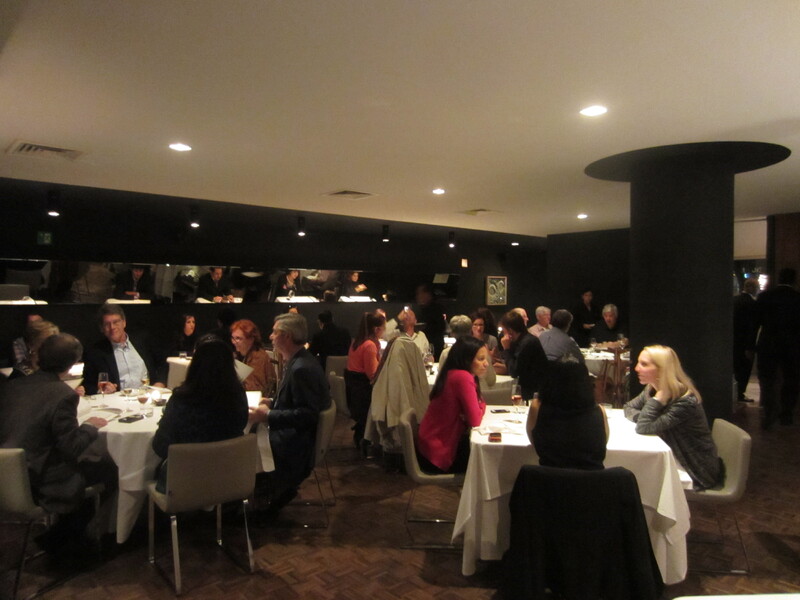 What was a great dining experience becomes a world-class one at the halfway point. “Suckling Lamb” and Eggplant. Isthmus Stew. Pineapple. Flowers in Escabeche. Charred Herbs. The night’s most puzzling dish to figure out was an “Isthmus Stew” variation from Southern Mexico with Barbacoa style eggplant. With my lack of Spanish speaking skills, I noticed the “Barbacoa” on the menu and immediately thought the dish would involve slow-braised or steamed in Maguey leaves lamb or beef, used in the Barbacoa method of barbeque. Often, the meat is marinated with plenty of citrus juice, chipotle, and cumin. Looking later at the online English menu translation, “Barbacoa” was even translated into “suckling lamb.” Nope, not here. There was no lamb anywhere. That “Barbacoa” cube is of eggplant, with the appearance and look of a suckling lamb, yet the taste will not fool anybody. The eggplant comes alongside a pineapple, compressed and marinated in its own juices, the perfect refreshing foil to the intense eggplant. 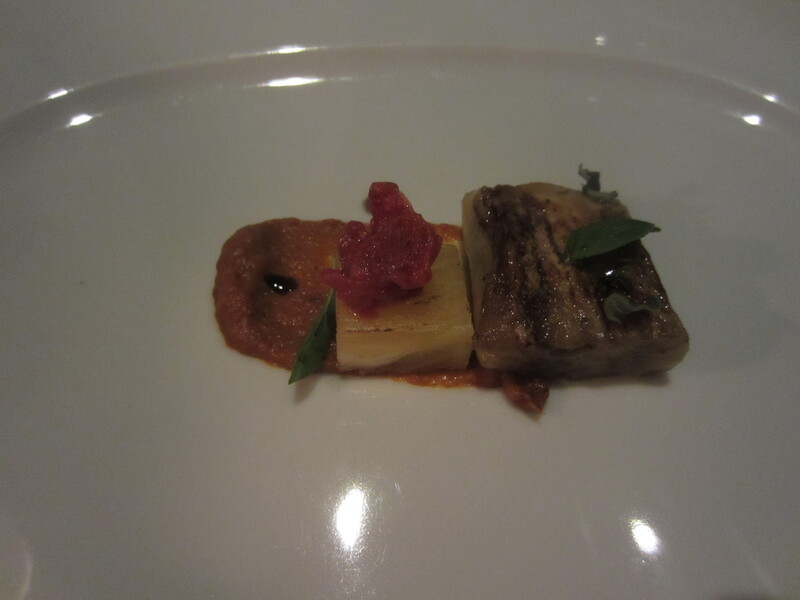 Charred herbs and a gorgeous red flower “in escabeche” complete the gorgeous, fully realized tableau. Yucatecan Pork Confit. Almond. Raisins and Cumin Mole. Tamarind. Cauliflower. The night’s masterpiece comes next, painstakingly striking and simple in preparation in the center of an oversized Arctic snow white plate. 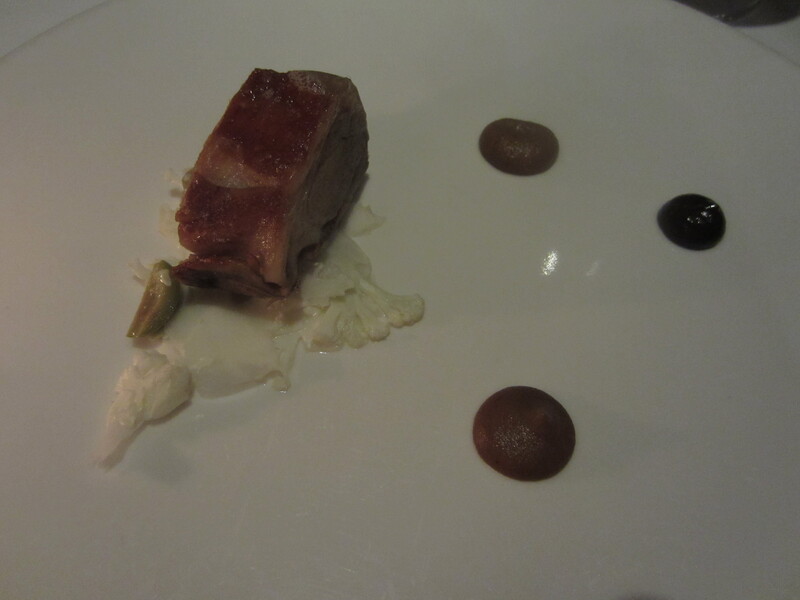 A candy bar shaped Yucatecan pork confit, essentially the most tender suckling pig conceivable, sits gallantly on a bed of halved green olives and the bitterness of thinly shaved raw cauliflower. A trio of sauce swatches guard the pig, boasting that elusive ratio of crisp, umami –rich, salty skin, thin layer of fat, and perfectly moist meat. 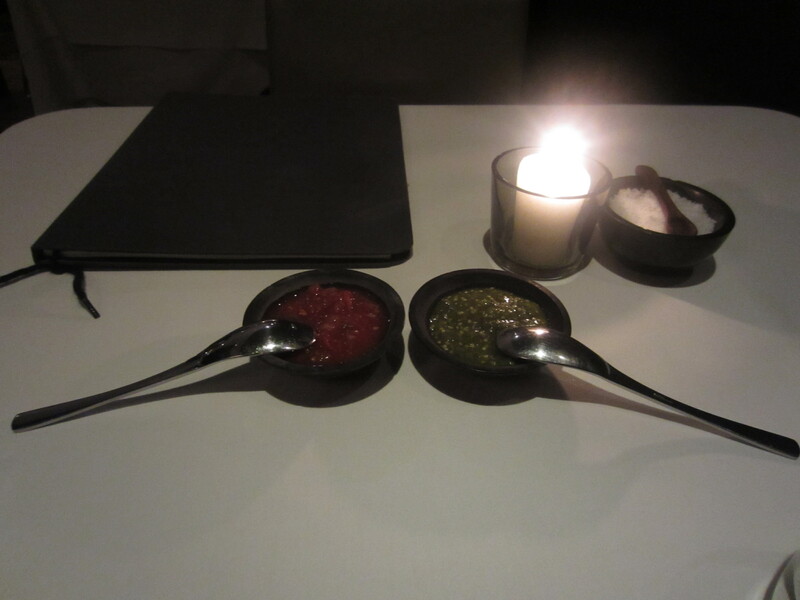 One sauce is the most fulfilling mole I’m guessing one can make from raisins and cumins, with a depth as stunning as the pyramids at Teotihuacan. Another sauce is an almond mole that stuns the diner into how powerful the humble almond can be. Last is a tamarind number, sweet yet deceivingly nuanced, the girl next door with a hidden secret. Each plays a role in accentuating or suppressing the pork’s intensity, a dish meant for royals. A dish that should be Olvera’s signature. It’s hard to follow up a showstopper such as the suckling pig. Take heart, there is no rest for the weary to come, and Olvera knows it. Literally, he brings out the fireworks. Banana. Macadamia Zest. Chamomile Flower. Cacao. Cream. First a savory to sweet bridge course arrives. A beyond-ripe banana, right at that perfect stage when the peel would be all brown and the banana should be used in ice cream, gets covered in a flour storm of macadamia nut shavings. Cacao nibs, the petals of a chamomile flower, and a pair of sour cream dollops lead to a rustic yet light, almost space-aged, creation that is so much more than just bananas, cream, and nuts, but doesn’t stray too far from that humble narrative. Heck, I could maybe even do this at home. Right. Then comes the palate cleanser—or so you think. 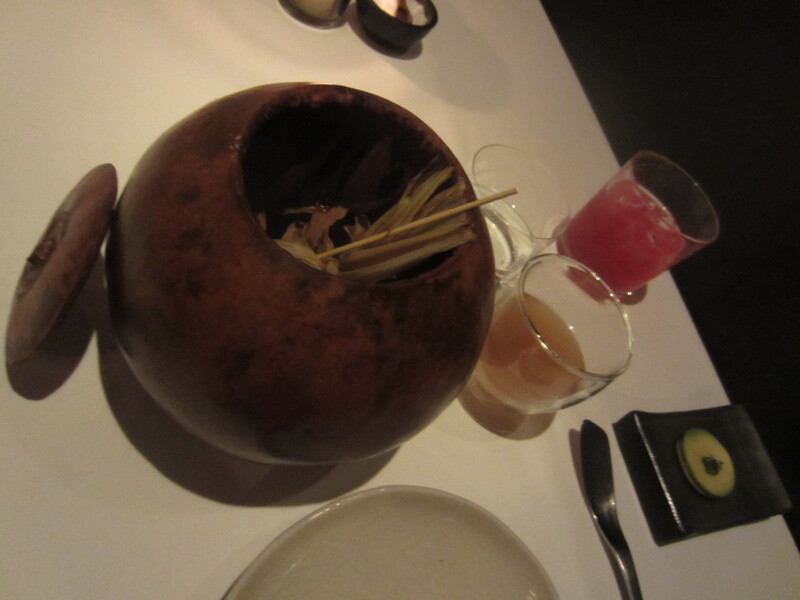 A chilled charcoal gray bowl holds a single quenelle of guava sorbet in a pool of our beloved Mezcal. 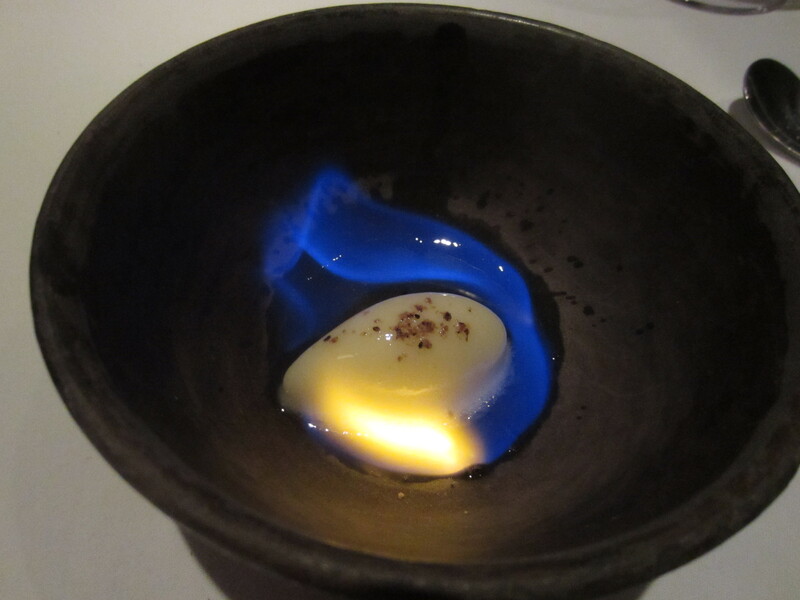 This is a Mezcal dish after all, so the sorbet is sprinkled with worm salt. Look out, here come the pyro-technics. 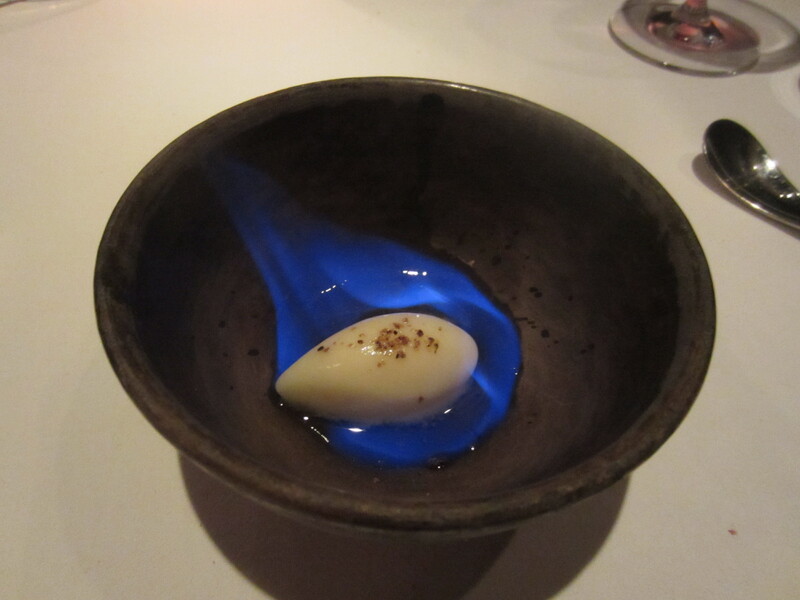 A match gets lit and the combustible Mezcal gets set on fire, flambéing the guava sorbet. Yet you notice how the sorbet only vaguely melts, never losing its form because of the reaction between the Mezcal and the ice-cold bowl. It’s a technological marvel. Stunning and captivating. Oh yes, the guava sorbet is as smooth as the waiter was lighting up the fish, sending you to that tropical island of your dreams. The Mezcal certainly is no hidden ingredient. After two or three of these, you might start seeing squirmy worms atop the sorbet instead of worm salt. Forget palate cleanser. This is a wake-up, alerting you to what brilliance you’re a part of this evening. Gazing around the room, you notice the orange flame from the matches sparking at tables left and right, a real clash to the black walls and cream-colored ceiling, bolstered by a single black pillar in the center. A pair of enormous flower vases, abstract modern art seemingly borrowed from the Pompidou, and 1950’s suburban home gray leather chairs serve as the room’s décor. Really, the notable décor are the imaginative plates and silverware with each dish, contrasting to the formal white tablecloths below them. The bowl for the beef tartare tostada was of elegant clear crystal that Alain Ducasse might use at Le Louis XV, while the squash tamal’s foot-wide plate is clay pottery featuring swirls of groove markings. The room is filled with English speakers: a table of two camera-toting bloggers, who have been there numerous times before and anticipate each dish like teenagers today do for a Bieber appearance, and one large business group with heavy Texan accents. Other tables are filled by locals, out for intimate dates or family birthday milestones. It’s a party. They’re having fun, a rarity in fine dining. It’s refreshing truthfully. The staff isn’t too stiff, nor too loose. The sommelier will go on for five minutes about the Tuscan red you’ve selected, and even the host opening your taxi door has extra Pesos as change for foolish tourists who don’t realize taxi drivers don’t give back change to large bills (guilty as charged). I step back from my previous statement that the beef tartare was the only clunker of the night. The espresso has to go in that category as well. A coffee importer I met earlier in the trip in Guatemala told me the best espresso he has had in Mexico was in San Diego. 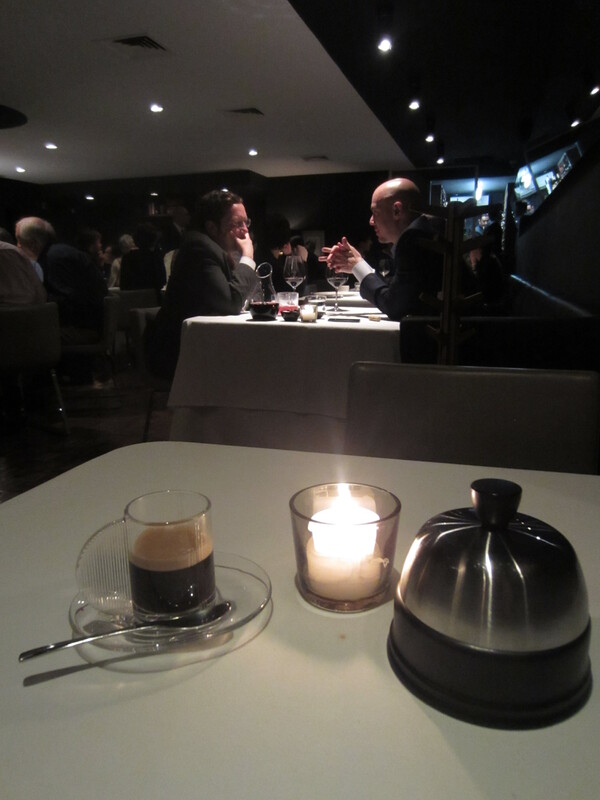 Well, the espresso at Pujol won’t win any barista championships. It’s of the meager, watery Italian style. Frankly, it seemed identical to Nespresso. Impressive Food. Not impressive espresso. Luckily, dessert is nothing like the espresso. 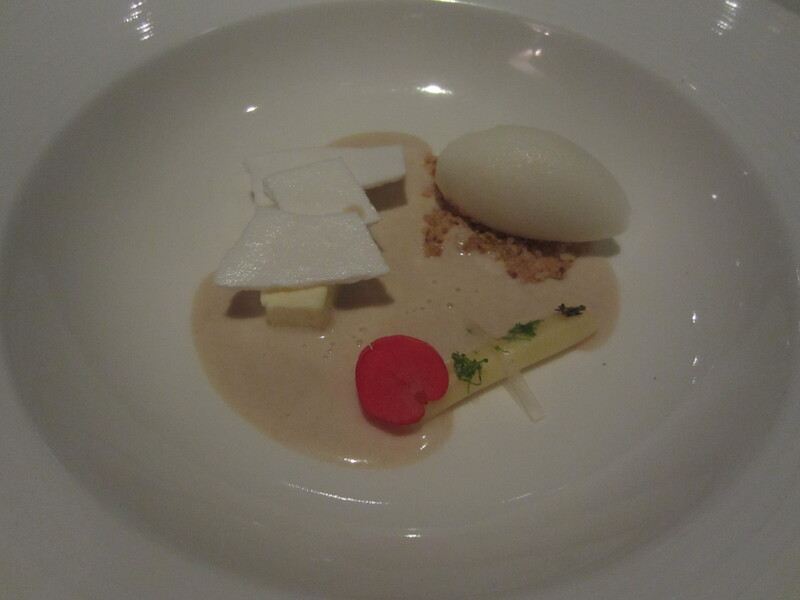 A landscape of various textures, all in calm white colors, is a beautiful conclusion after that Mezcal-guava sorbet jolt. 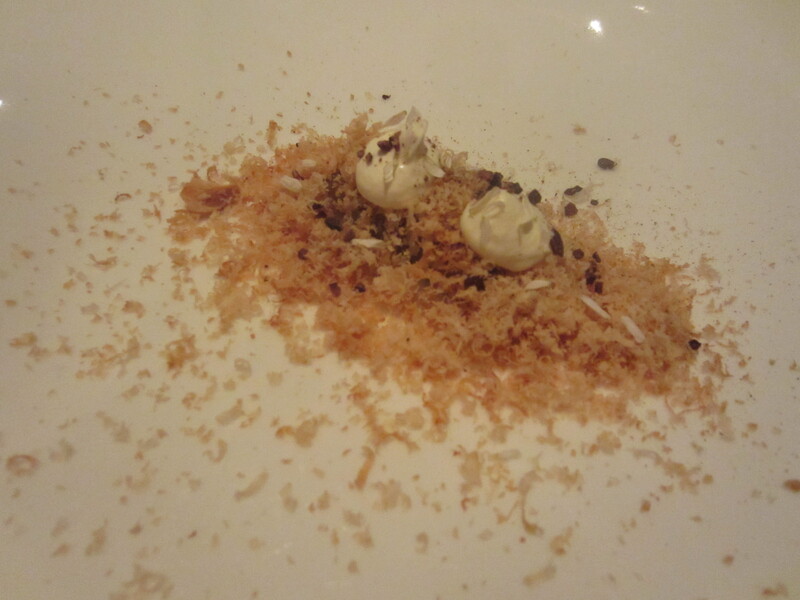 Olvera calls the dish a “cookie soup,” with a scoop of a pulque sorbet on a cookie crumble that adds a flash of energy and crunch. Opposite the sorbet is a thin bar of thyme biscuit topped by white chocolate wafers, and the presentation is completed with a cylinder of lemon gelatin topped with herbs and a red flower, the only bright color on the plate. So many textures and sensations going on here, with nothing too challenging or dominating. It’s a pitch-perfect, multi-faceted affair loosely based on the simple oatmeal chocolate chip cookie. With some pulque thrown in. Thyme Biscuit. Lemon Gelatin. Cookie Soup. Pulque Sorbet. White Chocolate. At not even 40 years old, it is incredible what Olvera has accomplished. The accolades and titles read like a biography for a legendary Bocuse or Robuchon figure: “Chilango (Mexico City Resident) of the Year” and “Chef of the Decade” in 2009 by Chilango Magazine, one of the “Thirty Most Talented Mexicans” according to Expansión, and now inevitably, a TV México eight episode documentary following his daily activities called “Diario de un cocinero” (Chef’s Diary). Olvera is a game-changer. Over a decade, he awakened Mexico’s viewpoint on its own cuisine, and he awakened what the rest of the world thought of Mexico’s cuisine. He is considerate of his native terroir, while open to letting his imagination roam free. He never forgets, most importantly, that he is a cook. Experimentation is important. Diners don’t want to eat the experiment gone awry. 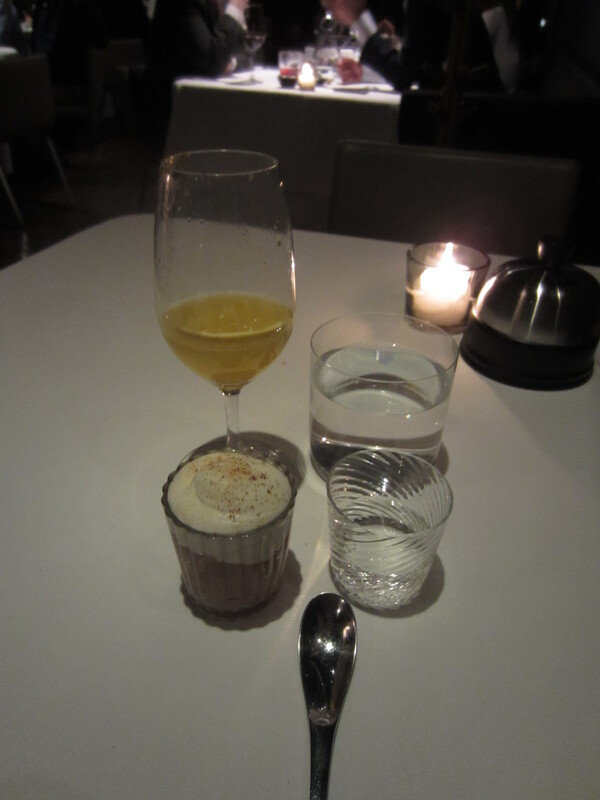 There is very little organic chemistry and questioning the laws of physics when Olvera sends to each diner a concluding crystal shot glass filled with a relentlessly dark chocolate mousse topped with an orange cream and grated tonka beans, the close sibling of vanilla. The mousse is strengthened by Xtabentún, a liqueur of anise and honey from the Yucatan Peninsula. This is chocolate mousse, powerful and to the point, free of pizzazz, silencing the table. Nobody doesn’t love it. If you think you won’t love it, stop the doubting immediately. Nothing beats in-your-face chocolate, as much as we try to think otherwise. More chocolate awaits at the door to take into your taxi or eat in front of the host immediately, in a box holding a colorful array of house-made truffles. Of course we could eat the entire box. However, it’s better to be considerate of the other diners and stop at two. One for now, one for the road. 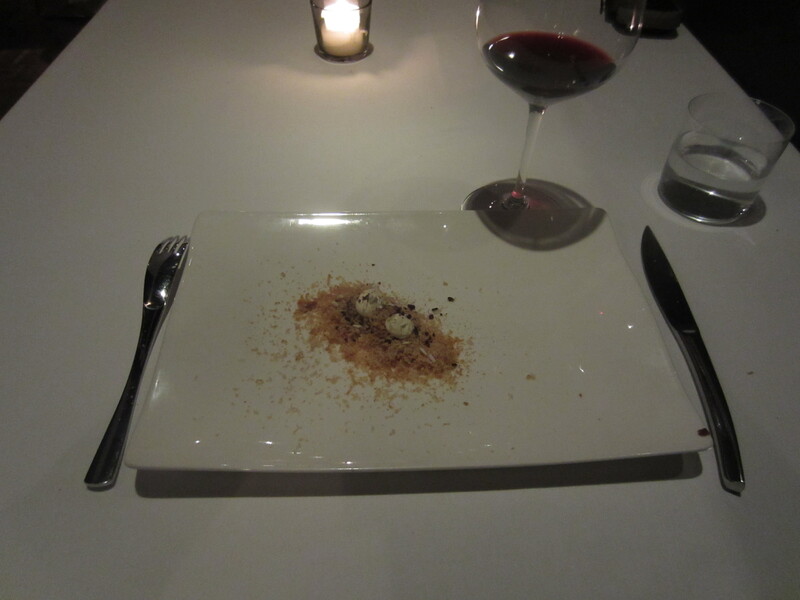 In a meal commencing with the image of a beetle, you depart with a whirl of chocolate truffles and chocolate mousse. Is this not a fitting start and end to a restaurant fusing the cuisine of Mexico to the rest of the world and to a chef bridging the years between the old and the unknown new? The avant-garde and the mysterious can be so rewarding. Then again, sometimes nothing ends the evening like good old-fashioned chocolate truffles. With the lack of explanation as to the truffles’ flavors, like life itself, you don’t know what you are going to get. In Olvera’s hands, I’m perfectly fine with that. This entry was posted on March 7, 2013 by trevsbistro. 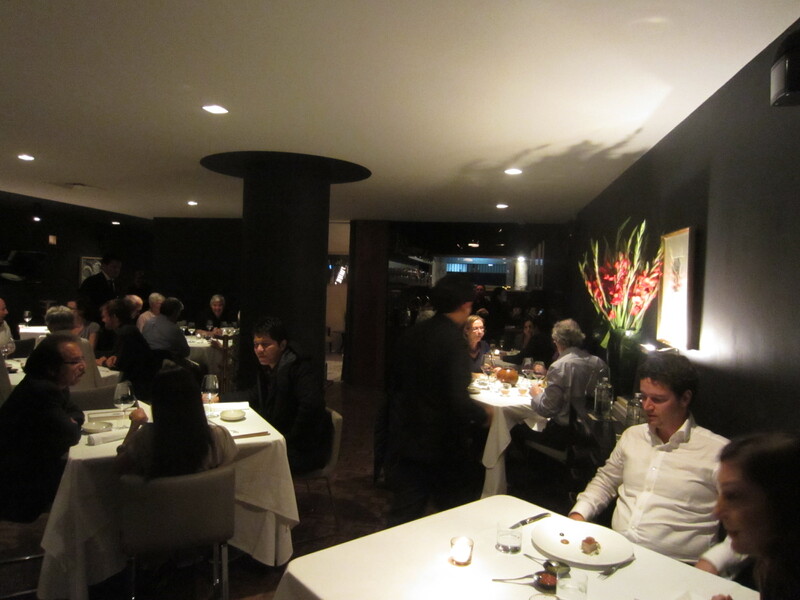 It was filed under Enrique Olvera, Mexico City, Pujol, Restaurant Review .